Swivel turret 1st stages are the most customisable design and often have a 5th Low Pressure Port from the top of the 1st stage. Four of your low pressure hoses can swivel on one axis so hose routing is easier and they can route out at more natural angles. The 5th port allows for more direct hose routing in certain setups. Same as your left twin 1st stage above with SPG, 2nd stage and LPI routed down the length of the cylinder. Switching to a DIR setup is easy and you'll need the 5th port for best results. Put your long hose primary on the 5th port pointing down at 7 O'clock. SPG off the left side with LPI hoses and your octo on a short hose is fitted to the right side to go over your shoulder. This gives you a great setup that is both safe and practical in most situations but will require a few custom length hoses. Fit transmitters to a short HP hose with a swivel pin, something like a 6"/15cm hose is perfect. That way the 15.000 php transmitter can move and be bumped without straining or breaking either the transmitter or the 1st stage. Consider DIR setups with a Primary Long Hose Donate arrangement, they're safer and more practical for all environments. You will need some custom length hoses and a little training for proper usage but it's a prefered setup by advanced divers around the world. Invest in some decent fixed spanners or wrenches instead of adjustables. If any of the nuts on my hoses are scuffed on the corners it's because an adjustable has slipped and taken the chrome off. All High pressure hoses have the same threads so all you have to worry about is length, and if a swivel pin is fitted. Low pressure hoses are usually 3/8" but there are a very few out there that are 1/2" but you can literally measure their circumference with a ruler to tell the difference. Take your time and make sure your tool is fitted correctly before loosening or tightening anything. So, let's look at those items in a little more detail. This one is not essential. I know plenty of DIR divers that use a dive timer, such as the Uwatec bottom timer, a cheap and cheerful version which only displays dive time in minutes. However, I think divers are missing a trick here, especially when first learning to manage ascent rates. 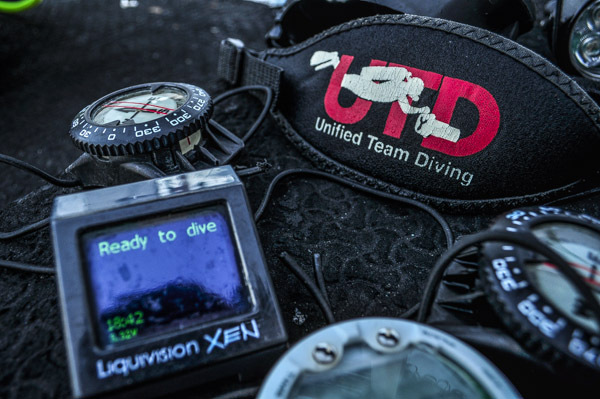 A timer that gives a display in seconds allows the diver to practice ascending. For example, if the diver wants to practice ascending at 3 metres per minute, then they know they should be going past the first metre after 20 seconds, and then second metre after 40 seconds etc. In this manner, a diver can become more familiar with ascent rates. you can also do ascents such as 30 second move 30 second stop far more easily. It's not the end of the world is your time does not have this feature, but it's a useful training tool. Whilst not critical for real life diving, this is important when training. Luckily, this one seems fairly common. When you are training, its useful to have some feedback from your timer about your control in the water column. What is equally important as a granular interval, such as 0.1 metre, is the fact that the timer should respond quickly to depth changes. A timer that takes several seconds to change will lag behind the diver, and prove an annoying training tool. We don't need lots of figures and letters. We just need the depth, and the time, in nice clear numerals that are easy to read in any condition. This is something that surprisingly few manufacturers seem to comprehend. There are new technologies emerging that allow displays to be larger and clearer than ever, but the dive industry has been fairly slow in adjusting. However, old technology with backlighting is commonly available and there are plenty of options. Dive timers can cost a lot of money. And kitting up on a UK rib can be like kitting up in a tumble dryer. Equipment needs to be robust out of the water, and reliable in of the water. There are dive timers and computers with great reputations, and there are some that do not have such great reputations. Seek the former and shun the latter! These are "nice to have's" rather than "must have", but I do like a timer that allows me to reset the stopwatch at the beginning of decompression. At that point in the dive I have little interest in the overall dive time, my focus is on the ascent. Another really useful feature is an average depth setting. Again, not essential, but a very useful feature. A back light is both common and useful, as is the ability to transfer your profile to a computer to analyse and log the dive for reference. Rather dated now, the Uwatec Dive Timer is still useful. It costs about 6700 Php, and it does what it says on the tin. No user replaceable battery. No profile upload. No fancy functionality. No second timer. No resetting. However, what it does do, very reliably, and simply, is tell you how many minutes you have been in the water, and how deep you are. And that's pretty much it. The latest version has an average depth function, but this is not resettable, so will be skewed with your descent. However, the unit is cheap and reliable, and beloved by many a GUE diver. This is certainly a reasonable backup choice. The D3 was a perfect DIR dive timer, and the D4 has an even larger and clearer display. A freediving timer is perfect for the type of diving we do, because all we need is the depth and the time. These little beauties have the additional advantages large clear displays, the ability to drop the profiles onto a computer via Suunto's free software, and critically a resettable stopwatch, so you can time your deco to perfection. The battery is user replaceable, and mine seems reliable, although I do hear about other units not being so robust. The D4 has a vastly improved display and reliability, although you do pay for it. The D6 and D9 add lots of cost but no real functionality of use to the GUE diver. Then there is the 2G. The first near perfect DIR timer. For a while the 2G was the smartarse of the divetimer world. It has a resettable stopwatch accurate to the second. It has a resettable average depth so you can set it when you hit the bottom of the shot - and then it continually updates. It reacts very quickly to changes in depth, has a large clear display with a great backlight, and is easily readable. Buttons are simple and easy to use. Profiles can be downloaded via Uwatec smarttrak software. It can be taken out of its mount and into a custom one so you can get rid of the strap and use bungee, which is ideal. Basically, for 13.500 Php it does what you need. But.. In cold water with cold hands and/or thick gloves the button system can be fiddly to operate, and the backlight which is needed to see the display at depth means you can't just glance over and see the information you need. Plus mine leaked mid dive after relatively few dives. To be fair Uwatec replaced the unit free of charge without a quibble. It took a few months to get the new one, but the process was easy, which lead me to believe this wasn't the first time it had happened. This has an ultra modern OLED interface, which means its crystal clear and readable in complete darkness. No more shining a torch on your timer. Its built to ridiculously tight tolerances, has more bells and whistles than Santa's sleigh, and as a fully paid up equipment junkie, is so pretty it makes me want to just fall to my knees and weep with joy. Another leap away from the traditional computer is the buttonless method of operating. Instead of buttons, Liquivision has used an accelerometer within the Xen which basically means you tap it to enter menus and change settings. While this takes quite a bit of getting used to, underwater this works really nicely. There are several shortcuts to the menus you need to reset during the dive such as the average depth and stopwatches modes. Of course there's always a drawback....the cost. This will set you back around 21.500 Php. My personal view is that until recently it's been top of its game for size and functionality. Shearwater and OSTC both have OLED display computers, but while great from a display perspective, their size, weight and higher price tag puts me off. They are undoubtably great as trimix computers, but as we only need a gauge you are paying for way more functionality than you need. Until recently there hasn't been a direct competitor for the Xen. Now there is. Latest up is the XDeep Black BT. A simple OLED bottom timer to rival the Xen. The display is crystal clear as you would expect, and some additional features such as the digital compass, and integrated battery pack rechargeable via a USB connection. And all for 15.000 Php. One of the most remote diving destinations in the Philippines, Tubbataha Reefs Natural Park is only reachable by liveaboard between March and June. It’s also considered a UNESCO World Heritage site and boasts 600 species of fish, 360 species of coral, 13 whale and dolphin species, and 11 species of shark. You’ll need a week to explore all the sites, but don’t miss Amos Rock where a gorgonian-covered wall hosts a variety of soft corals and massive schools of fish. The area is famous for its large reef sharks. As the Philippines’ best shark dive, Monad Shoal is home to regular sightings of thresher sharks. At 100 feet (30 meters), divers are nearly guaranteed at least one observation of the crazy-tailed shark over two diving days. This is the most consistent site in the world for thresher sharks, and happens to be the only place a thresher shark was photographed giving birth. Grab your gear and head to this tiny paradise for a thrill of a dive. Easily accessible from Manila, Puerto Galera is a diving paradise with crystal clear waters, abundant marine life and a variety of diving environments. While there are several dive sites worth note, the most sought after is Canyons where currents sweep divers through three gorgeous canyons covered in a variety of soft corals and sponges. Take your time inside these structures to find large schools of fish including barracudas, batfish, snappers, emperors and trevally. 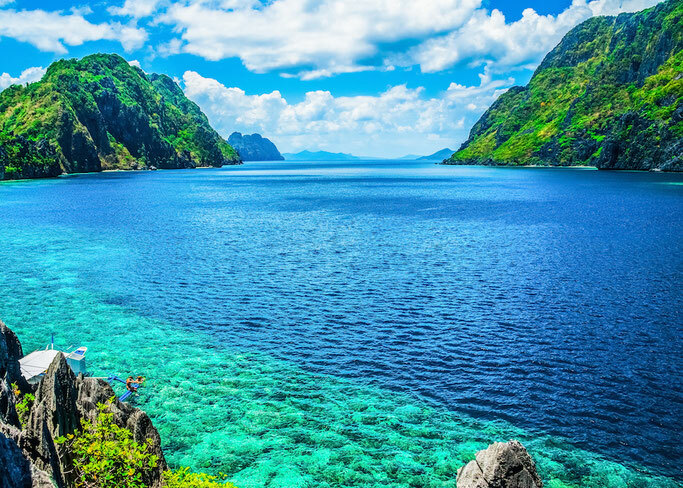 Known to be the second largest coral reef in the world, Apo Reef Natural Park is the second UNESCO World Heritage site reef in the Philippines. It is quite a journey from the main islands, so you’ll find Apo Reef is also best dived from a liveaboard. Be sure to include Apo 29 in your dive plan; it’s often considered one of the best yet most challenging dive sites in the area. The large seamount rises to 82 feet (25 meters) below sea level. Here you might spot various reef sharks, thresher sharks, hammerheads, manta rays and schools of pelagic fish. The best time to go is between November and May, and be aware that many dive operators require 100 dives as a prerequisite for a dive safari to Apo Reef. An underwater shoal covering 7 hectares of flat area, Manta Bowl sits between the plankton-rich waters of the Ticao and Burias Passes. With constantly flowing current, the alley has become a magnet for manta rays as both a cleaning and feeding station. The best time to spot these graceful creatures is between December and May. Other occasional visitors include massive whale sharks, hammerheads and tiger sharks. Sometimes referred to as the “Poor Man’s Chuuk Lagoon,” Coron Bay served as a brief harbor for several Japanese warships during World War II. In September 1944, 11 of these ships were sunk by an Allied air attack. Today, these wrecks are fascinating dive sites, and one of the most accessible is the Okikawa Maru, a 525-foot (160-meter) tanker. The top of the ship’s superstructure sits at 32 feet (10 meters) below the surface, making this a great wreck for all levels. Just be aware that strong currents are occasionally present. Not to be confused with Apo Reef, Apo Island is located off of Dauin, near Dumaguete. The entire area is a world-class diving destination, but drift-lovers will want to add Coconut to their must-dive list. Locally called the Washing Machine, this site isn’t for the faint of heart. But you’re sure to see LOTS of interesting marine life, including huge schools of pelagic fish, banded sea kraits and sea turtles. Occasionally bait balls form. So find a sheltered spot and watch the action unfold. There’s more to Boracay than powdering white sand beaches that stretch on for as far as the eye can see. The diving around this paradise is also great, and the best site is Yapak. You never know what you might see along this 106-foot (32-meter) wall. Drift along, looking out to the blue for tuna and sharks that float effortlessly by. Turn to the wall and search for macro life, including colorful nudibranchs and pygmy seahorses. If you are extremely lucky, you might even get a glimpse of the strange mola mola ascending from the depths. A coral reef paradise, Balicasag is a short boat ride from Bohol. Ask anyone and they’ll tell you that one of their favorite dive sites around this small island is Divers’ Heaven, a wall dive between 30 and 130 feet (10 and 40 meters). Large schools of fish such as jacks and barracuda populate the area and are seemingly indifferent to divers. Because currents are light and the depth can be determined by the diver, this is a great site for beginners. The best night dive on our list, Manit Muck is one of several worthwhile dive sites in Anilao. Also known as Secret Bay, this site may even rival some of the muck diving found in Indonesia. At any time of day, you might find ambon scorpion fish, ghost pipefish, wonderpus octopus, mantis shrimp and nudibranchs. But be sure to dive Manit Muck at night to see this environment come to life. The most life is concentrated between 10 and 70 feet (3 and 21 meters). Let’s start this topic off with the first thing that should always be imprinted into your mind, not only when you take your regulator in for service, but when you pack it away under your dive gear, store it for an extended period of time or wonder if your regulator is overdue for service. This is your life support equipment! It is of the same importance as the systems on a space shuttle, it is delivering oxygen rich air to your lungs to control your body’s functions and keeping you alive, so you know what will happen when its mulfunction 20 mtr down bellow. By far this is the MOST important piece of equipment that you own, as reasoned in the above paragraph so we must take care of it accordingly. Your regulator should be serviced annually no matter if you have 1 dive or 100 dives. Why? Because your regulator is built of many moving parts, especially o-rings which are made of either Rubber and on most or all newer regulators it will be EPDM (Oxygen Compatible to 40%). After a year the integrity of the o-rings start to diminish and the lubricants start to wear down and become stale. So it’s not a matter of “Oh but I only dove with it 4 times so I can service it in another year”, it’s a time issue. Just like the oil in your car, only good for 3 – 4 months, you wouldn’t think twice about changing the oil in your summer sports car. In OceanZoneExplorers We service all brands of diving regulators with eather 6 months or 12 months warranty. Technician is always at the shop to service or just test your gear any time. Our dive shop is located in 54 Timog Avenue. Quezon City just across the road from LUXENT Hotel. If you scratched your wide angle dome port we can remove the scratches. If you do not service your photo gear atleast once every 12 months you risking flooding your expensive camera or strobes plus we all well know how much stress it can be when you underwater ready to take a photo and the housing wont cooperate. When all controls are working smooth it is much more fun to use your set. Once we get your gear we completely disassemble it and degrees all parts, wash of the dirt and sand. Next step is all parts go through Ultra Sonic Cleaner after that we use high pressure blow gun to dry the parts. We use only high quality lubricants like Nauticam on all parts, when you get your equipment back you will be surprised how smooth its working! Whether it was on a dive boat or from shore, how many times have you looked over and seen a group of divers either kneeling or stirring up the bottom? As a marine scientist, it pains me to see corals and other “benthic” (aka bottom dwelling) organisms become smothered by sediments. It requires an enormous amount of energy for corals to remove these sediments, leaving them in a state of stress if the sediment doesn’t kill them from suffocation. Many times I have acted like an underwater “dust pan” swatting the material off my coral friends from these kinds of divers. You could argue that bad buoyancy is part of the problem but there is an underlying issue. Divers that learn on their knees, dive on their knees. I have seen this time and time again with other instructors that teach skills kneeling on the bottom. When I run into their students later, I find them on the bottom because that is how they were taught. UTD divers do not touch the bottom, even in their very first pool session. The UTD difference emphasizes to divers that they always need to be neutrally buoyant in the water column, never on the bottom. This is creating a culture of ocean friendly divers that maintains the benthic health of our marine ecosystems, and our visibility! If you looking for UTD diving courses in Manila pass by our store we are UTD Training Facility based it 54 Timog Avenue, Quezon City. Unified Team Diving is an agency that teaches Ocean Friendly courses only. We dont run a factory like all the dive shops you see around. We dont need to promote our classes we work only with like minded people those who care about environment and safety and quality of knowledge they will get after the course. We charge people for education and not certification! If you looking for dive center in manila and safety and the quality of classes is your main concern please come visit our dive shop and meet and talk to our instructor he will answer all your questions. In the Philippines, there are a lot of caves. Most of these caves are unexplored because they are located under a private land owners’ sector. 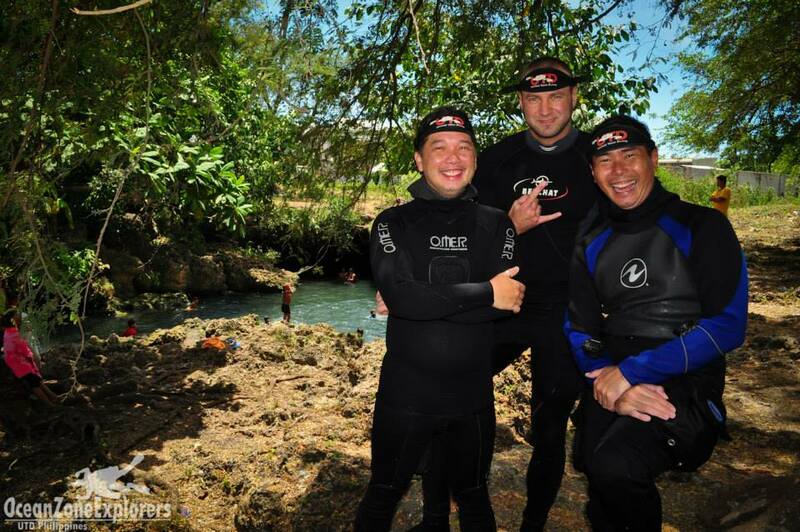 Last year, May 2014, we went to Cebu to meet up with a friend and dive the Pawod Cave discovered in 2001 by Doc Alfonso Boy Amores. I was much honored to be with 3 UTD Instructors in the Philippines, Juan Naval, Maike Espiritu and Igor Subora. On the first day, we catch up Maike, who is Cebu based over a sumptuous meal in a pizza parlor nearby a dive shop. With a full stomach, our cave diving training begun with the introduction of theory and skills. We were taught how to read the cave arrows, knots, placement of the spools and so on. It is extremely different because caves can be enormous on space or tight to squeeze in. Our training was the latter. I was excited and learned so much from my usual recreational underwater exploration. The second part of the training was the simulation. I had to carry not only 3 spool, but 4. Juan made a course using the spool tying it from pole to pole and put arrows as soon as we were ready. We simulated like it was murky and a truly zero visibility environment, so we wore our masks the opposite was of normally wearing it and started. One hand on the diver and the other on the rope. Rope is a diver’s lifeline in cave diving, so never let go! Igor led the first simulation and I did the second time. It was sooooo cool and it added up to my excitement. Over dinner, we planned our first cave diving to Pawod Cave for the next morning. We head to Pawod Cave at 9am transported by our super cool tiny jeepney and geared up as soon as we arrived. The water was murky because the locals were enjoying a swim on the surface before we came. The entrance was dark and intimidating for first timers but as we went along, it became more mesmerizing each time. It was so interesting that you just want to go on every channel you see, but we weren’t allowed as yet. We ended the first dive and the three went ahead for the second one. It was truly something that I will forever remember and would love to do again. What an experience! 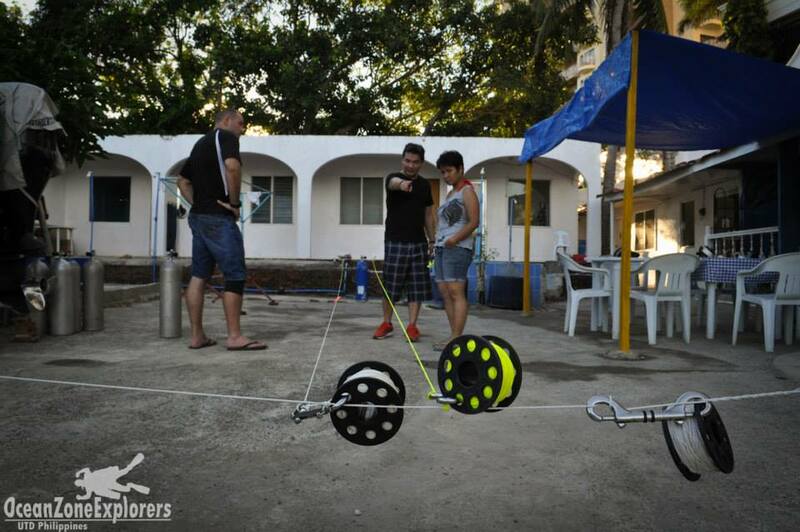 We were on the trip to Anilao, Batangas on last weekend's January 26 -27 with the first 4 Reef Balls to plant at the depth of 9.3 Mtr on the sandy area in square formation, with little bit of currents. The weight of the RB the smallest weighted 70 kg and the heaviest 112 kg. As the truck loaded with Reef Balls left Manila going to Anilao, Batangas we were thinking to unload RB at the small private pier as the original Resort where we decided to plant the RB has around 250 or more stiff steps, but found out that they refused to let us unloaded RB without the permission so we had to carry the RB's one by one all the way down from parking lot to the shore line. Well back to the positive we found out that it doesn’t require much time for landing RB to the bottom with orginized team of divers. March 23 we will be going back with full scale project if you like to join you should have decent dive skills underwater and have some experience working with lift bag. We just want to thank Anthony Calero from Anjush Builders for such a big contribution to the project on creating the moulds and the reef balls. Big credit to Jeff de Guzman one of the best UW photographers I've ever met, for coming with us and documenting project with absolutely stunning underwater photos. Of course Juan Naval UTD Instructor for providing lift bags and helping planting RB's to the bottom. Yvan Pagulayan and Dang for safety of the operation underwater. We will be monitoring RB's every 2 weeks all reports and photos will be posted here for those who are as much exited as we are. Check later for updates and photo report from this trip.